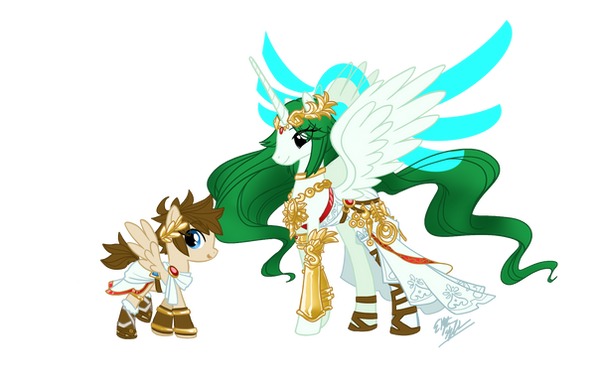 When the angel captain Pit and his "brother" Dark Pit are called by Palutena when she informs them a friend of hers is in trouble, it leads to a new adventure and new experiences for the two angels as they are turned into Pegasus in the land of Equestria. With Hades back once again, teaming up with Chrysalis, how will the angel's fare when they can barely use their bows?! At least twilight and her friends are there to help, right? Taking place after "Kid Icarus: Uprising" and "MLP:FIM season 2" and changing the FIM world into a Human/Angel/Gods/ect. world. Pit, angel of Palutena, needs to train Celestia's army; but when Discord and Pandora take over the thrown, Pit needs to team up with Twilight and the girls to stop the two and save Celestia. The story will mostly follow around Pit as he interacts with the girls. Filly Twicarus Uprising is an exciting crossover of the original "Kid Icarus Uprising", in pony! (SPOILER ALERT) If you own "Kid Icarus Uprising", and haven't already completed the story, be warned that all of the content in this story is from the game. And please, if you have an idea of what the characters might be, keep you're ideas to YOURSELF. If one asks of your opinion, you can always private message him/her. Thank you. Cover art by johnjoseco on Deviantart! Quick Warning: This story contains spoilers and characters from the Kid Icarus: Uprising video game for the Nintendo 3DS. Read at your own risk. Pit - an angel who guards the earth - , otherwise known as Kid Icarus, comes across a crisis when the once fallen Lord of the Underworld Hades opens a portal to another world to bring the mythical draconequus named Discord to their world and free him from his stone prison. In return the Goddess of Light, Palutena, brings the Goddess of the Sun from another world, Celestia, to their world so that she and her subjects can help overcome Hades and Discord's huge army and save the world again. After being vanquished by Celestia a thousand years ago, Nightmare Moon has returned to exact her revenge on the Goddess of Light and the ponies she protects. Celestia has tasked Fluttershy, her strongest and most reluctant soldier, with stopping the Queen of the Underworld. But the situation is not as simple as it looks, for Nightmare Moon's mysterious resurrection and rampage are just the beginning of a conflict between several unlikely forces, and Fluttershy is about to get caught in the middle. A pony adaptation of Kid Icarus: Uprising, starring Fluttershy as Pit. Links to the game's music are embedded in the text of the chapters, for those who like to listen as they read. Special thanks to Twifight Sparkill for the cover art. *Some of the early chapters are subject to future revision. Pit is pretty happy. He has saved the earth from aliens, a interdimesional super parasite and the lord of darkness himself so he has reason to be. Plus HE CAN FLY ON HIS OWN NOW, so he's pretty happy about that to. But the univserse has a wired way of messing things up all the time and it comes in the form of a banishment spell from Pandora. He and Dark Pit are thrown into a place that neither of them were really expecting, a place where friendship is one of the most powerful forces around. After an accident involving a Lightning Chariot joyride, Viridi, Goddess Of Nature, ends up in Equestria. She soon finds herself in a conflict with a newly revived Hades, Lord Of The Underworld who has his own plans for Equestria. I don't own Kid Icarus, any of the characters from the series or out of the series. Kid Icarus belongs to Nintendo and so do other Nintendo characters mentioned in the story.